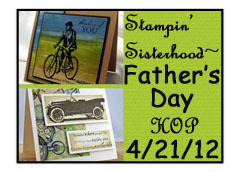 It's time for another Rubbernecker Stamps Blog Hop!﻿ We're getting a head start on Father's Day. Winner to be announced on the SS Blog 4/28 (1 week to hop). Go back to the Sisterhood Blog and let them know you have hopped. As a bonus we will draw an EXTRA winner for a STAMP SET of your choice, just for sharing our hop on your Facebook page or Blog!! After you have shared, just go back to the Stampin' Sisterhood Blog and let us know where you have shared our hop. Here's my take on the challenge. Our dads have passed on so I created a card that I could use for any of the male members in our family. I used real wood for the panels. I chose a light wood because alot of the old "Woody's" had light paneling. I added a layer of Crystal Effects over the entire car (except for the wood) to give it some extra shine. 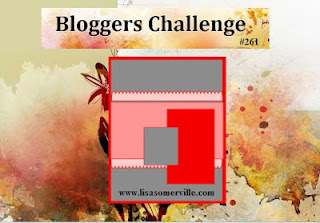 I used the Blogger Sketch Challenge from Lisa Somerville's blog as my starting point. Your next stop is Charlene Merrick (grab some M&M's for me while you're there, will you?) Here's a list of the hop order in case you get lost along the way. Be sure to leave a comment on each site to be eligible to win and thanks for spending some time with us! Good Luck! Your Woody is fabulous!!! The wood looks real and the colors are perfection! You created one terrific masculine card! Charlene, I love the patterns on this - and that wood panel side is so neat! Super masculine design! Love your woody Charlene - one of my favorite old style of cars and trucks - your DP is perfect for this wonderful masculine card! This woody image is terrific and the way you colored it reminds me of one friends of ours use to have. Cool idea to use the crystal effects for added shine on the car. Your chevron pattern looks pretty cool, too. Great guy card, Charlene! Charlene, this is great. I love your old woodie! The dp is perfect with it too. Great Father's Day card, love the real wood look on the Woody. TFS! What a GREAT card! I love the station wagon image... It brings back long ago memories of RI, and driving to the beach wth friends in summer in a vehicle just like that! Brings back memories! Great card! Just a great card! so many interesting elements! LOVE the wood on the woody! Fun card. Memories♪♫ Thanks for the memories that awesome car brings! Love the huge whitewalls and the shiny paint job. Great masculine card. What a fun card. Your woody is great. You did a wonderful job. Love that real wood. Your Woody would make any man proud - such a clever idea to use real wood! thanks for sharing ! What a wonderful Father's Day card, Charlene!!!! The old Woody is sooo cool looking and I love the colors and papers you used!!!!! Love your card and all the different elements, especially the wood on the car. Great card for a man. Love how you brought some sparkle to the car. Charlene, I echo what others have said...the wood on the car is absolutely so spectacular. Totally makes this card! Nicely done! Love your idea to use the wood panels and Crystal Effects. I'd guess IRL they would enhance the whole card. What a great idea to use real wood on the car. I like the look it gives the card. Great card. I like the background paper. Your card is terrific. Thanks for including how you created the car. It is fantastic. That woodie is fabulous! Great job! Fabulous masculine card! Love the wood panels--what a great idea! Great masculine card--love the Woody! Great detail on the Woody! Great masculine card - love the added wood panels on the Woody! Thanks for playing along with the Bloggers Challenge! Love your color choices for this! Great guy card Charlene! Just loving all these guy cards, and that old woody takes me way back! Love that card, a very masculine card! Thanks for joining us at blogger's challenge.